Tearing out of Zurich’s Kloten Airport in a rented silver Škoda, I hop on the A15 toward Schaffhausen, a route that unexpectedly takes me over the German border and back into northern Switzerland even before I have a chance to check my bearings. My first stop is the Rhine Falls, the largest waterfall in Europe. The cascade may not be at its summertime peak, when 600,000 liters of water roar over the rocky 23-meter drop every second, but flanked by the cliff-top Schloss Laufen castle, it’s still a prime photo op. 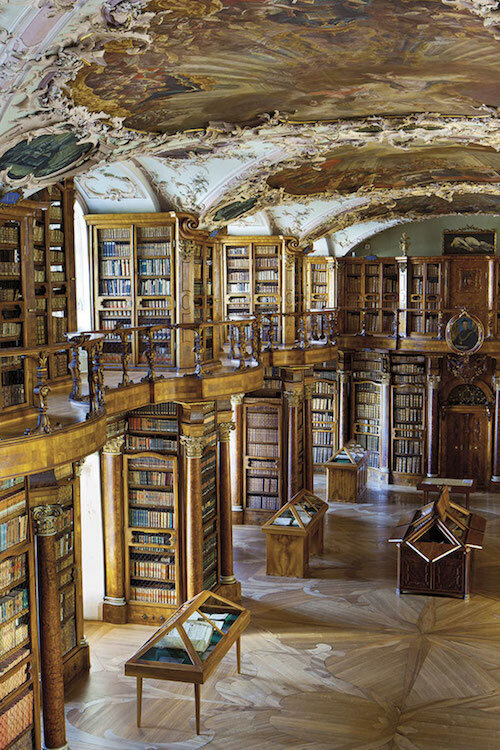 Inside the famous abbey library at St. Gallen. Photo from Getty Images. 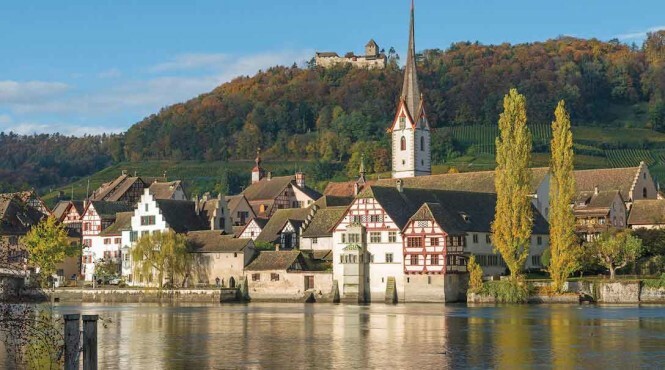 Just downstream on the north bank of the Rhine is Schaffhausen, the compact capital of the canton of the same name. Leaving the car and my bags at a modern, residential-style hotel called Arcona Living, I cross the street through a pedestrian tunnel and emerge at the edge of Schaffhausen’s traffic-free Old Town, feeling like I’ve stepped into a time machine. 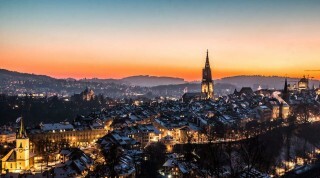 Founded in the Middle Ages, Schaffhausen grew rich on commerce from the boatloads of cargo that were offloaded here for portaging around the Rhine Falls. The medieval guildhalls and burghers’ houses that line the cobbled and fountained streets attest to the affluence of those days, their Renaissance-era facades festooned with frescoes and ornately corbeled oriel windows. I’ll spend the afternoon roaming about the area, but first, lunch awaits at the Güterhof restaurant, a converted 17th-century salt warehouse right on Schaffhausen’s Rhine promenade. All log beams and timber paneling and sheepskin-covered benches, it’s an ideal spot for a bowl of riesling soup—an addictive regional specialty—and a fillet of perch from nearby Lake Constance, washed down with a pint of the malty house beer. Stein am Rhein’s riverside Old Town. 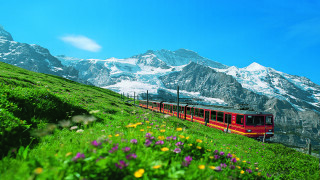 Courtesy of St. Gallen Bodensee Tourism. I walk off the meal on the 200 or so stone steps that lead up through a hillside vineyard to the Munot, a circular fortress built around 1580 based on plans by Albrecht Dürer. Its battlements—accessed by a spiral ramp designed to allow the passage of horses—provide a panoramic view over the town’s tiled rooftops and spires. 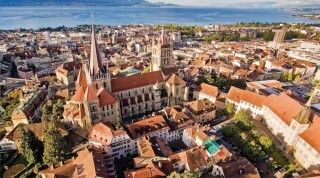 Down below, another must-see is the All Saints abbey, a former Benedictine monastery that houses some fine examples of Romanesque architecture and a museum whose collections range from Roman antiquities to modern Swiss paintings. Looking southeast from the battlements of Shaffhausen’s 16th-century Munot fort, with the Rhine River flowing downstream from Stein am Rhein. Photo from Getty Images. Back at my hotel, I sit down for dinner at the buzzing Weinwirtschaft restaurant, ordering another riesling soup, a prodigious Wiener schnitzel, and an equally prodigious sampling of local wines. My favorite? The crisp white TroisBlanc from Weinkellerei Rahm in nearby Hallau. Rolling countryside in the Appenzell area. Photo from Assalve/Getty Images. After a morning massage at the hotel’s Asia Spa (which also features sauna facilities and a hammam, for those who have time to linger), I’m back on the road for Stein am Rhein, a 20-minute drive east through the rolling farmland of Thurgau along the south bank of the Rhine. The rural German enclave of Büsingen is just across the water now, occasionally glimpsed through thick stands of spruce and larch trees. Then, as if to confirm this borderland’s baffling geography, my GPS indicates it’s Canton Schaffhausen again on the opposite bank; five minutes later, Germany makes an encore, followed by Schaffhausen once more: an exclave called Oberer Kantonsteil. Stein am Rhein occupies the southeast corner of this area, and I cross a bridge to reach it, halting at the only traffic light along this leg of the trip to wait for oncoming traffic to squeeze around a single-lane bend in the road as it enters the burg’s medieval center. 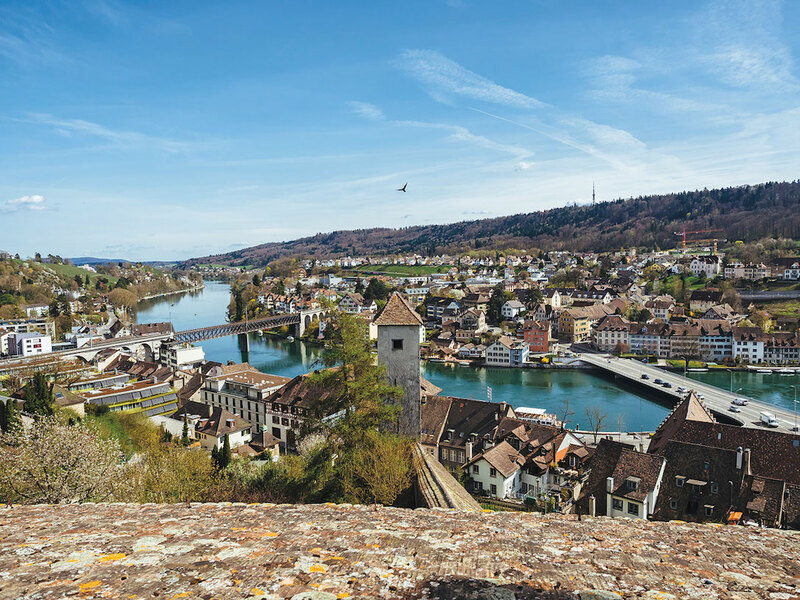 Stein am Rhein’s Old Town may be small, but it’s enormously popular with coach tours— not surprising, given its fairytale assemblage of gabled and muraled buildings. The town hall, its two upper stories half-timbered and crowned by a clock tower, dates to the 16th century, and is well worth a visit if you can find a guide to let you into the armory and age-burnished assembly rooms upstairs. 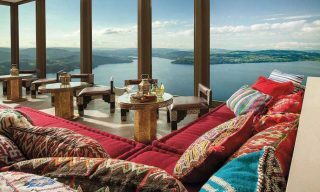 A 10-minute walk away is Hotel Chlosterhof, a brick-clad a air that overlooks the Rhine as it flows out of the lower arm of Lake Constance, known locally as the Bodensee. The restaurant here, Le Bateau, serves a mean venison entrecôte, which I devour with a side of spaetzle while gazing out at the swans and plea- sure boats on the river. After lunch, I recross the Rhine and follow Route 13 along the Bodensee, which from here stretches some 80 kilometers all the way to the Austrian town of Bregenz. 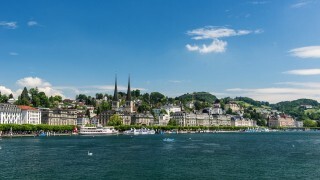 The lake has been a crossroads of Europe for centuries; Konstanz, the largest city on the Bodensee and the birth-place of airship pioneer Count Ferdinand von Zeppelin, sits on an appendage of the German state of Baden-Württemberg. It’s also right in my path, more or less, so I park my car in the adjacent Swiss city of Kreuzlingen and walk over the border into Konstanz’s old quarter for a look. And why not? History was made when the most important assembly of the Catholic church—the Council of Constance—convened here in the early 1400s to negotiate an end to the papal schism. The building where the bishops and cardinals wrangled still stands on the harborfront, not far from a much more recent monument to those days: Imperia, a cheeky nine-meter-high statue of an amply bosomed courtesan holding a wizened pope and emperor in her upraised hands. Back on Route 13, I drive another 34 kilometers to the lakeside town of Rorschach and stop for a restorative dip at an old wooden badhütte (bathhouse), the last of its kind on the Bodensee. Then it’s time to turn away from the water and into the hills toward St. Gallen, where, 20 minutes later, I check in to the 113-room Einstein hotel, by all accounts the city’s best. No doubt part of that reputation stems from its proximity to the UNESCO-listed Abbey of St. Gall, just a short walk away. While the baroque cathedral here is magnificent, the highlight is the Carolingian monastery and its rococo-style library—a trove of price-less medieval manuscripts displayed under an exuberantly frescoed ceiling amid carved bookcases lined with thousands of printed tomes. As I shuffle toward the library’s entrance in a pair of mandatory felt slippers, my guide points to a Greek inscription above the door: Psyches iatreion. “The healing place for the soul,” she says. Certainly, it would be a balm for any bibliophile. A couple of blocks away, a brief tour is all that is needed to take in the exhibits at the Textile Museum, which recounts the history of what was once the city’s most important industry, embroidery. More attention-grabbing is what lies across the way: the Stadtlounge, a 2005 collaboration between Swiss artist Pipilotti Rist and architect Carlos Martinez that installed molded-concrete benches, sofas, and even a faux Porsche in a once-drab bank plaza and then carpeted the whole thing in rubbery red polymer to create a sort of outdoor living room. It’s surreal. Dinner that night, at Lokal, is another departure: the restaurant inhabits part of a former locomotive depot. With its reincarnation six years ago as a cultural center, the circular building now hosts an art gallery, a theater, and one of the coolest dining rooms in town: a buzzing, dimly lit space with distressed concrete walls, chrome candelabras, and a toothsome lamb ragout. 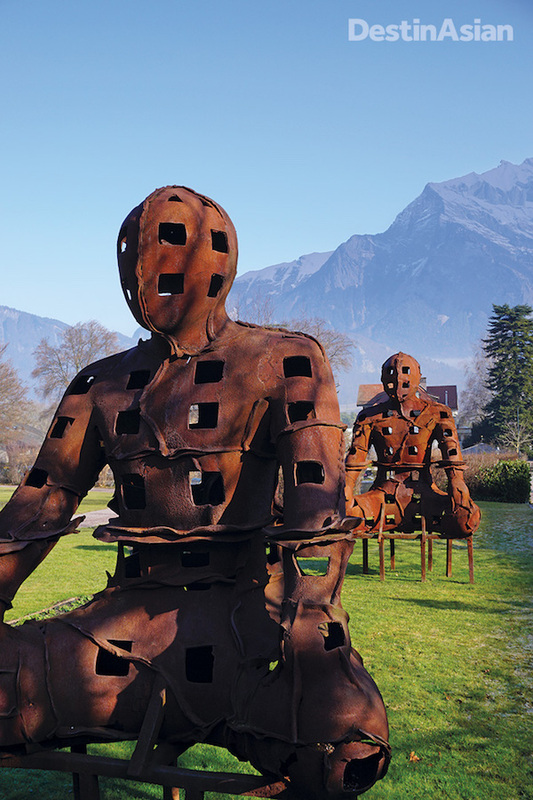 Outdoor art installations at the Grand Resort Bad Ragaz. Photo by Christopher P. Hill. 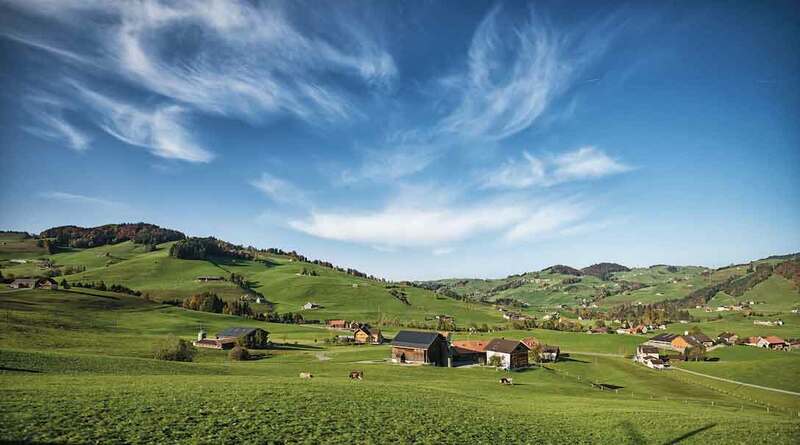 Appenzell, my first stop, lies half an hour to the south along winding mountain roads. The village and its surrounding region—a canton in its own right—is picture-book Switzerland: Alpine peaks, cow bells, gaily painted wooden houses, and, if you happen to be here toward the end of September, the Alpfahrt—a procession of lower- garlanded cows and traditionally garbed herders coming down from the high pastures. Instead, I join a parade of fellow tourists on Appenzell’s shop-filled lanes, where confectioners do a brisk trade in unpronounceable pastries like Landsgmedchrempfli and, if you’re charming, the lady at the Appenzeller Käseladen cheese shop will ply you with samples of the local fromage, aged to progressive degrees of pungency. 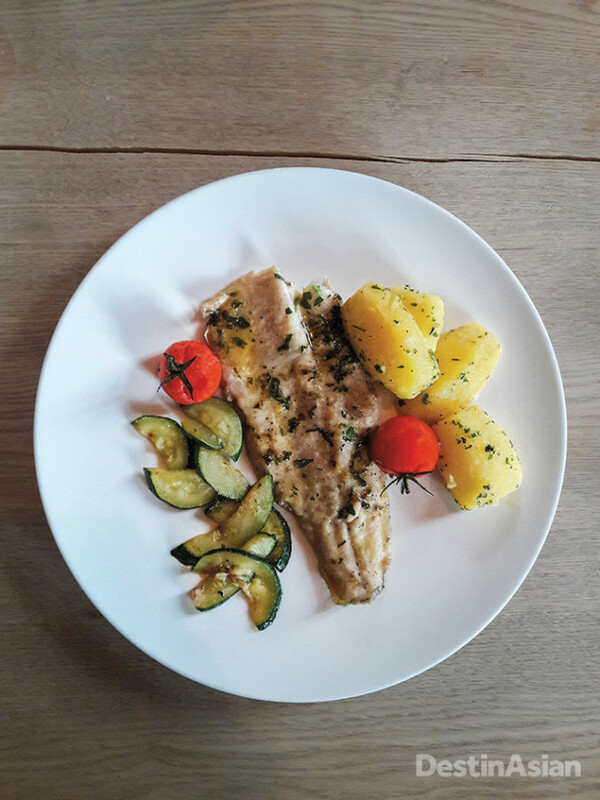 A lunch of lake perch at the Güterhof restaurant in Schaffhausen. Photo by Christopher P. Hill. After polishing off a breaded escalope of pork in a cozy dining room overlooking the town square, I’m back in the Škoda for the drive to the spa village of Bad Ragaz, 57 kilometers to the south. Zigzagging down a precipitous mountain road brings me to the A13 at Oberriet and alongside the Rhine once again. Across the water this time is the farmland of the Vorarlberg in westernmost Austria. Fifteen minutes later, I’m passing Liechtenstein and the Rätikon range of the Alps, which extends into the neighboring Swiss canton of Graubünden. Though Heidi country is close—the fictional character spent her early years in Maienfeld, on the Graubünden side of the Rhine—I press on eagerly to the Grand Resort Bad Ragaz, which I’ve been told is very grand indeed. It is. 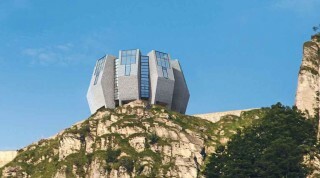 Encompassing two adjoining hotels that date to the 1800s, a modern block of spa suites, two golf courses and a casino, a health clinic, a slew of restaurants, and the adjacent Tamina Therme spa complex, it’s a destination in itself. But as enticing as my room is, there’s really only one thing to do before dinner—soak my road-weary muscles in the hotel’s colonnaded thermal pool, whose source spring in the nearby Tamina Gorge has lured health-seekers since the 13th century. The mineral-rich water works its magic in no time. Bleicheplatz 1; 41-52/631- 0000; doubles from US$206. Berneggstrasse 2; 41-71/ 227-5555; doubles from US$180. Freier Platz 10, Schaffhausen; 41-52/ 630-4040. Hotel Chlosterhof, Oehningerstrasse 2, Stein am Rhein; 41-52/742- 4242. Grünbergstrasse 7, St. Gallen; 41-71/272-2570. Grand Resort Bad Ragaz; 41-81/303-3030. This article originally appeared in the April/May 2017 print issue of DestinAsian magazine (“Rolling Along the Rhine”).